Jaipur (The Pink City) the capital of Rajasthan state in Indiawas founded in 1727 by Maharaja Sawai Jai Singh II, a Kachwaha Rajput, who ruled from 1699-1744. Initially his capital was Amber city, which lies at a distance of 11 km from Jaipur. He felt the need of shifting his capital city with the increase in population and growing scarcity of water. The King consulted several books on architecture and architects before making the layout of Jaipur. Finally under the architectural guidance of Vidyadhar Bhattacharya, (initially an accounts-clerk in the Amber treasury and later promoted to the office of Chief Architect by the King) Jaipur came into existence on the classical basis of principles of Vastu Shastra and similar classical treatise. After waging several battles with the Marathas, Maharaja Sawai Jai Singh II was keen on the security aspect of the city. Being a lover of astronomy, mathematices and astrophysics, Jai Singh sought advice from Vidyadhar Bhattacharya, a Brahmin scholar of Bengal, to aid him to design many other buildings including the Royal Palace in the center of the city. The construction of the city started in 1727. It took around 4 years to complete the major palaces, roads and square. The city was built following the principles of Shilpa Shastra, the science of Indian Architecture. The city was divided into nine blocks, of which two consist the state buildings and palaces, with the remaining seven allotted to the public. Huge fortification walls were built along with seven strong gates. For the time, architecture of the town was very advanced and certainly the best in Indian subcontinent. In 1853, when the Prince of Wales visited Jaipur, the whole city was painted pink to welcome him during the regime of Sawai Ram Singh. Today, avenues remain painted in pink, provide a distinctive appearance to the city. In the 19th century the city grew rapidly; by 1900 it had a population of 160,000. The city’s wide boulevards were paved and lit. City Palace. The City Palace is an imposing blend of traditional Rajput and Mughal architecture. It is a vast palace complex occupying nearly one-seventh of the Pink City. It was originally built by Maharaja Jai Singh II. The complex is divided into a series of courtyards, sprawling gardens and buildings. It is home to several palatial structures like the Chandra Mahal (home to present Maharajah of Jaipur), Mubarak Mahal (housing a textile museum), Diwan-e-Khas (or Hall of Private audience housing the two largest silver vessels in the world, which are duly mentioned in the Guinness book), the Diwan-e-Aam ( or Hall of Public Audience) and the gateway Ridhi Sidhi Pol (with four small doorways decorated with motifs depicting the four seasons). Another integral part of the palace complex is the Hawa Mahal, standing away from the main complex. 300 Rs the entrance with audio guide (all languages) and camera. Jal Mahal (or the Water Palace) is on the way to Sisodia Rani Garden. A Rajput style architectured palace sits in the center of the Maan-sarovar lake. The lake is often dry in the winter, but summer monsoons frequently turn it into a beautiful lake filled with water hyacinths. Jantar Mantar is the largest of five astronomical observatory build by Maharaja Jai Singh during the period 1727-1734 in north India. It is located very close to the City Palace. The observatory consists of fourteen major geometric devices (or yantra in Hindi) for measuring time, predicting eclipses, tracking stars in their orbits, ascertaining the declinations of planets, and determining the celestial altitudes etc. Boards and plates give elaborate explanations of the use of each device, and guides can be hired to provide much the same information in a more digestible format. JALMAHAL – (6 kms) on the way to Amer, this small palace is set in the middle of Man Sagar Lake. A paved causeway leads upto the beautiful water palace. Amber Fort, (11 km from central Jaipur).This massive fort-palace complex built in hybrid Hindu-Muslim style dates back to Raja Man Singh and was the royal palace of the Kachwahas from c. 1600 to 1727. 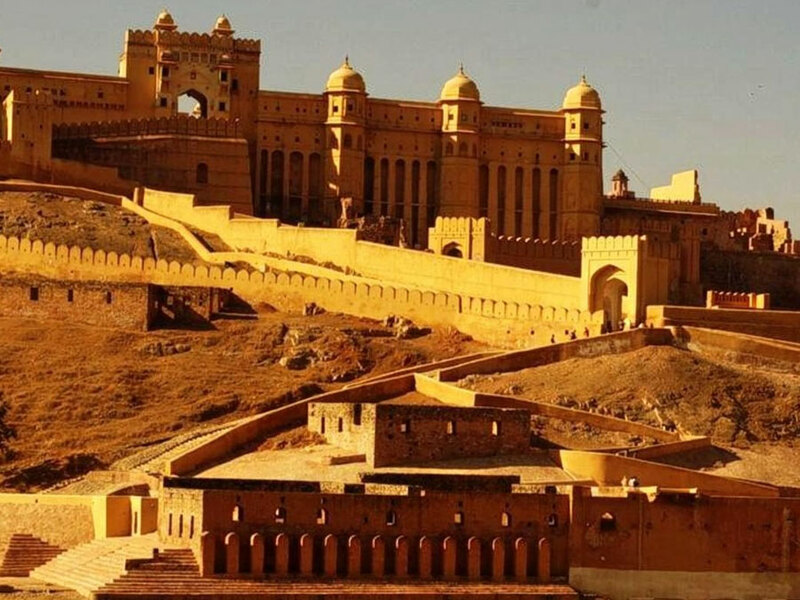 The name has nothing to do with the rather pretty pastel yellow colour; instead, the fort is named after the town of Amber, in turn named after the goddess Amba. The main sights within the fort include the Sheesh Mahal, adorned with thousands on thousands of mirror tiles on the walls and ceiling. The fort/palace grounds are sprawling and have no signage whatsoever in any language, so it’s worth getting an audio guide or a real guide. It’s a bit of a hike up from the town, and the touristy thing to do is to hitch an elephant ride to the top (in order to get an elephant it is better to to arrive there in the morning, otherwise at midday the elephants are over. But the road that elephants pass is not so long). The elephant riding costs 900 (fixed government price) as of July 5th 2011. The real guide will cost about Rs. 70-100 and will also take you to the Rajasthan Kala Mandir (a government operated shop) to buy souvenirs. Another thing not to be missed is the sound and light show in the evening from 7 to 8 pm. Amitabh Bachhan narrates the story of Rajasthani kings and the script is written by Gulzar. Cost is Rs. 100 per person and don’t forget to take the mosquito repellant. The light show can be watched from outside the fort but the sound won’t be audible from there. Rs. 10/50 Indians/foreigners, plus optional Rs.25/100 for still/video camera, Rs.100 for audioguide. Jaigarh Fort Never conquered in battle, this was considered the strongest of the three forts in the area. It is best known as the site of the world’s largest cannon, the Jaivana, which was test-fired only once — according to legend, despite using only the half the design amount of gunpowder, the cannonball flew 35 km! A better reason to visit the fort, though, are the scenic gardens at the other end and the spectacular views over the Amber Fort and the hills around. The remains of the foundry where the Jaivana (and many more) were cast are also in the fort grounds. An autorickshaw can be taken to the top of the fort from the autorickshaw stand in front of the Amber fort and a round trip will cost about Rs. 200. It is also a 20-40min walk from bottom of Amber palace entrance (take the elephant’s path and turn to the left of palace to Avahi gate). Worth staying 1h, very nice view/panorama, a lot less tourist than in Amber palace which makes it more appreciated. Please note, there are multiple board with “no tips allowed” if you have some unasked help/guide asking for it. Rs.50 plus Rs.40 for camera. Nahargarh Fort. The smallest of the three forts, notable primarily for excellent views over Man Sagar lake and the vast sprawl of Jaipur. The fort also houses the (relatively) compact Madhavendra Bhawan palace, although its former splendour is fading fast under a new layer of graffiti and pigeon droppings. Portions of the movie Rang De Basanti were shot at this fort. To go the area where the “Pathshala” song was shot, take a left turn as soon as you enter the fort. An autorickshaw can be taken from the autorickshaw stand in front of the Amber fort and a round trip will cost about Rs. 250. Rs.10 entry, Rs.35 for Madhavendra Bhawan. The Pink City rejoices and celebrates the fairs and festivals with pomp and gaiety since time immemorial. These fairs and festivals reflect the rich culture and heritage of the region. Jaipur has a flair for celebrating every occasion. ELEPHANT FESTIVAL – (March-April) the elephant enthrall the spectators on the day of the Colourful festival of Holi at Chaugan stadium. Beautifully decorated elephants assemble for royal procession, Elephant polo match, races etc. & Rajasthan Folk music & dance performances are part of the festival. GANGAUR – (March-April) this festival is celebrated by the maidens and married women, and is dedicated to Gauri, the incarnation of Goddess Parvati, the consort of Lord Shiva. A Colourful procession is taken out from Zanana Deodhi of the City Palace, passing through Tripolia Bazar, Gangauri Bazar, Chaugan and converging near Talkatora for two consecutive days. TEEJ – (July-August) festival marking the advent of monsoon, swings are hung from trees and decorated with flowers. Young girls sing songs of love and about the rain. The festival is dedicated to parvati, commemorating the day when she was united with Lord Shiva, A magnificent procession is taken out from City Palace, similar to the Gangaur procession, for two consecutive days. MAKAR SANKRANTI – celebrated on the 14th of January, every year with traditional fervour, the devotees take a holy dip in the holy tank at Galtaji, it has now also become a kite flying festival, millions of colourful kites come on the sky of Jaipur on this day. SHITLA ASHTAMI – (March-April) this festival is locally called as Basoda, is celebrated to ward off the dreaded disease of small pox. The most famous fair is held at the Shitla Mata temple in Chaksu (on the Jaipur Kota Road), people gather here to pray and celebrate. DONKEY FAIR – (Khalkani Mata Mela) (October) the donkeys day at Looniyawas near Sanganer, Thousands of donkeys from all over north India are brought here for buying and selling. The donkey races and sports are organised for the merriment of people. A rare sight indeed. Sanganer Airport is well connected with New Delhi, Jodhpur, Udaipur, Mumbai, Goa & many major cities of India. Jaipur Railway Station is well connected with Delhi, all major states & cities of India. NH-8 connects New Delhi with Jaipur and NH-11 connects Jaipur with Agra.